Here is one of the lovely Zoyas I got in the recent 2 Free offer - Zoya Barbie, a gorgeous bold light pink with subtle shimmer. I have been looking for the perfect light pink for awhile now, and while I always end up liking the polishes I get in this search, it is never quite perfect. I will say now that I have finally found what I was looking for! Gorgeous girly perfection. I am not kidding when I say I have been looking for this color for a long time, haha. Creamy smooth application that you would expect from a Zoya, two coats for opacity, great wear. I have a feeling she is going to get a lot of wear! Added flowers using one of my latest Konad acquisitions, m74 and Konad Special White. 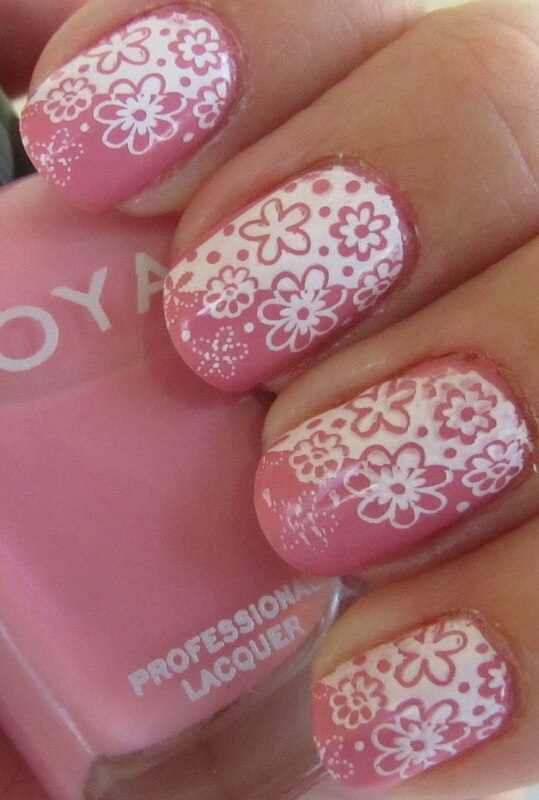 This was a fun super girly manicure! Thanks for sharing - I always wondered what this stamp looks like. Very pretty! This is so much nice blog. So super cute and girlie! !